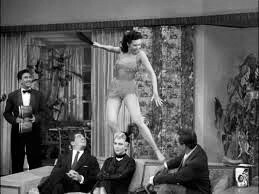 But my first sight of Ann Miller in the musical Kiss Me Kate, dancing on the grand piano to Cole Porter’s Too Darn Hot, put an end to that particular fantasy. 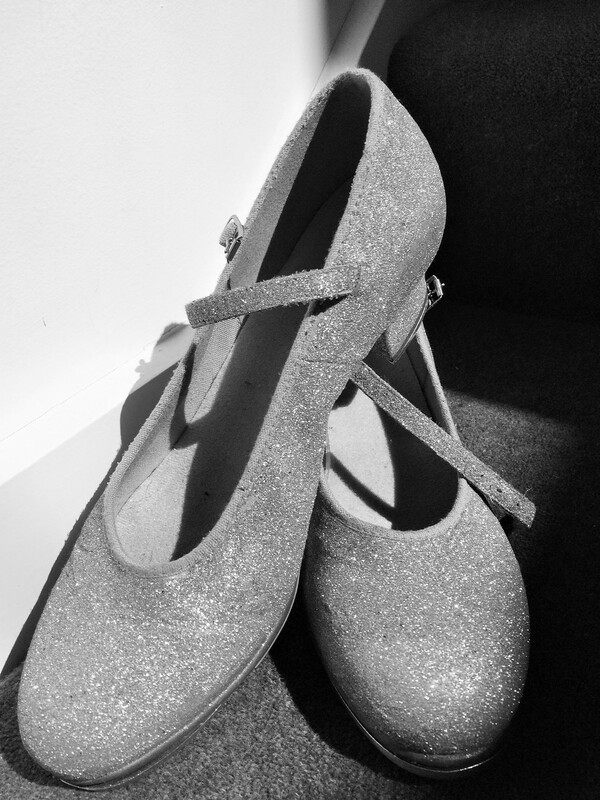 The sound of her tap shoes on its shiny mahogany surface was like machine-gun fire. (Hardly surprising, given she could tap at a speed of 500 taps per minute). How was a gal to compete with that? Fast forward fifteen years. Ann Miller has gone to hoofers’ heaven, and a tap school has opened at the end of my street. All augurs well for my long-delayed foray into the world of glitter and greasepaint and 500 taps per minute. This is my story………. The tap studio is a glittery wonderland of pink sparkles and 1960’s spiky clocks. The mirrored walls make the room seem much larger than it is. Our teacher, Miss Lulu, looks like a pretty china doll caught in a 1950’s time warp. I soon make friends with Donna, who is an older lady keeping her lessons a secret from her family. Everyone else has proper tap shoes covered in coloured glitter. I’m wearing flat black sandals with taps attached. Note to self: enrol for Tap Shoe Glitterisation Class later in the year. Before we start, we are asked to fill out a form indicating our willingness to perform in the end-of-year concert. I write “Possibly” in the space provided. The lesson commences with a few Step Heels, then progresses to Heel Toe repetitions. Crush the bug! Crush the bug! When the music slows down, it gets harder. Faster music helps to keep the momentum going. Donna and I agree that tap dancing should delay the onset of Alzheimer’s: we are using parts of our brains we’ve never used before. The opposite foot has to kick up before putting the heel down. The sound of heels on the wooden floor is mesmerizing, but I can’t allow my concentration to drift off even for a second. None of us can look at ourselves in the mirror. It’s much easier to watch our feet or follow Miss Lulu from behind. As soon as we look in the mirror, we lose our way. We agree it’s a right brain left brain thing. All eyes are focused on our teacher’s twinkling toes as we try to reproduce her movements. By the end of class, we have mastered four steps! I ask for my concert application form back, cross out “Possibly”, and write “Definitely” in big, bold letters. Today I meet Tess, who is there to lose her muffin top. We laugh when Donna tells us that her daughter thinks her mysterious regular Wednesday morning appointments are treatment for a terminal disease! I learn a lot about tap screws today. They have to be a little loose for maximum sound effect, and I must not scrunch my toes. The sound is totally different. Learned Step Ball Change and Front Slap, then mastered Front Slap Ball Change. Miss Lulu says we catch on fast. We preen, even though we suspect she says that to all her students. We work up a sweat today, so Tess is happy. Today’s class has lots of stamping, which is a great way to get rid of tension. We learn a new sliding step, which makes me think I’d better have rubber stoppers attached behind the taps to reduce the chance of slipping. I don’t want a hip replacement at my age. We note Donna’s absence and wonder whether she’s run out of excuses to throw her daughter off the scent. Miss Lulu still thinks we’re a gifted bunch, but I think we’re just a welcome relief from the three year olds she teaches in the class before ours. My left foot is misbehaving, but I manage a breakthrough today: watch myself in the mirror and keep tapping. Move over Miss Miller! I’m coming on in leaps and bounds, but am having trouble with my Fred Astaire: right foot front slap, left heel drop, right heel drop (left toe up), slap left foot upright heel drop, knock left foot, right heel drop. Who needs Sudoko? The Cranky Fred is similar but with a lot more stamping. You gotta love those names! The start of a new term and I’m the remedial member of the class due to trouble with my weight distribution, a rogue left foot and lack of practice. I must practice more. Or even a bit. Someone suggests I practice on a sheet of plywood on the front verandah. Front row seats for all the neighbours? I think not. Plans afoot (sorry!) for the end-of-year concert. Our group is going to dance to the tune of Que Sera Sera, with lots of swirling and arm gestures. I’m in favour of anything that will take the audience’s attention away from my feet. For the costumes, think Doris Day in a pinny crossed with a Dolly Varden cake with a touch of pink-and-white meringue and lots of frills. Gorgeous! Can’t wait for Glitterisation Class this weekend. It’s going to be the trifecta: champagne, glitter and optional false eyelash application. Treated myself to proper tap shoes in honour of forthcoming glitterisation. My daughter comes along to give my old black sandals a makeover. The choice of colours is overwhelming. I opt for Diamond Blitz, a sort of holographic mix of silver and gold. Looking at the gorgeous acquas, pinks, apricots and purples chosen by others, I begin to regret my conservative choice. We all sit in a circle and start applying glue. Miss Lulu flits around like a colourful butterfly with old-fashioned saucers (what else?) of champagne for the adults and glasses of blackcurrant juice for the children. The convivial atmosphere only increases with the late arrival of one brave man, here to glitterise his wife’s shoes. The rest of us bemoan the fact that he’s already married, but chide him on his inability to multi-task: he needs more work on his conversation skills while simultaneously applying glitter. Finished at last. We take our shoes outside in the bright sunlight to take photos. Mine are gorgeous! So classy! Everyone wants to get their hands on my Diamond Blitz. My daughter is now the proud owner of her very own ruby slippers. Seventeen pairs of shoes are lined up on the pavement and instructed to smile by Miss Lulu, who is wielding the camera. Lucky the shoes are photogenic: it’s a great photo. I must practice tap before my next class. We learn about Call and Answer: half the class does a step while the other half watches then repeats the step. We are taught about The Look. It’s what you do when it’s not your turn to do the step but you still want to hog the spotlight. It’s not a fixed grin: it’s a sort of frozen head toss that screams “Look at me!” It usually involves feet close together, one knee bent with the heel raised, head turned to the side and eyes looking at the heavens. I’m so good at The Look. Otherwise I’m hopeless. Tess and I plan to practice over the weekend. Lots of firsts today: our first male class member. John is a great sport. Looks a bit like Father Christmas. Our first twirls which make us all dizzy. Lisa thinks she’s going to vomit. And it’s the first time I remember to bring my glasses. Maybe that’s my problem. Excitement is building up as the day of the concert draws closer. The seamstresses in our class start getting busy. I volunteer to be the Costume Princess, which involves collecting money for the fabric. Anything to avoid dealing with my nemesis, the sewing machine. Starting arm movements: lots of ‘giving’ (right, left and both arms), lots of ‘Barrels of Monkeys’. Some straight arm action with hands flat a la china dolls. We are told to strive for perfection, with St Doris as our role model. Regular midweek practice at Tess’s house in the weeks leading up to……. Tess comes over so we can get ready together. We giggle like schoolgirls: my children watch in morbid fascination. False eyelashes prove tricky. Foundation makeup applied as per the concert title: Too Much is Never Enough. 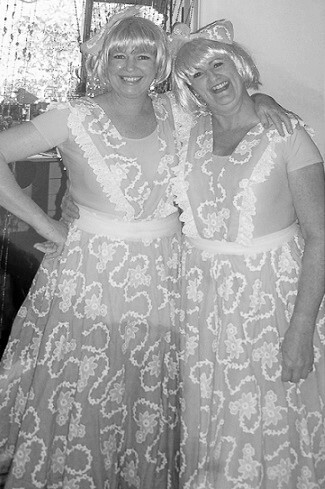 White lacy tights, huge pink bows on shoes, matching bows on wigs (a very Doris Day white bob). We inspect each other and laugh so much we fear for our lacy tights. The theatre is stifling. I scan the audience for my family: my mother, my children and best friend. My father is conspicuously absent, but I will get my revenge on Christmas day when I give him a DVD of the concert. And make him watch it. I watch the other acts while applying pink sparkly nail polish that someone has handed to me. I know no one will see it, but it makes me feel special. Think I overdid the eyelash glue: I’m having trouble blinking. Our group is called backstage, and my heart starts pounding. Positions please! As the curtain goes up I’m dazzled by the spotlight. The music starts and I’m off, whirling and twirling. Nothing fixed about my grin. I beam from ear to ear: I’ve found my calling. From this day forth I plan to devote myself to the pursuit of fame and all things glittery.